Mathieu van der Poel will make his long-awaited debut in some of the major Cobbled Classics in 2019 but the young Dutchman has no immediate plans to reduce his multidisciplinary race program. The cyclocross world champion will continue racing a full cyclocross program combined with XCO mountain biking where he was Olympic ambitions and on the road until at least after the 2020 Tokyo Olympic Games. After winning his 30th ‘cross race of the season at the Superprestige in Hoogstraten, the 24-year-old explained his plans for the coming years. “I will definitely ride a full cyclocross program for a few more seasons, and I will combine the ‘cross with the road and mountain biking until the Olympic Games, after which a discipline may fall away,” he said. Van der Poel has long been pegged as a future star on the road but is one of very few top-level male cyclists who manages to be competitive and even dominant in multiple disciplines. 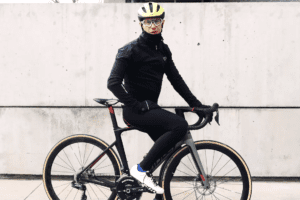 As the cyclocross season wraps up, he is currently eyeing the swept in the Superprestige cyclocross series, something that has only ever been done once by Sven Nys. The final round is next weekend in Middelkerke. “Now that I am so close, I want to realize that too,” van der Poel said about trying to win every round of the Superprestige in a single season. Van der Poel has had a ridiculously strong season across disciplines. He’s won 30 cyclocross races in 2018-2019 along with his second career elite men’s world championship title. Van der Poel expanded on his mountain bike program in 2018 earning three bronze medals in UCI Mountain Bike World Cups, second overall in the World Cup standings and a bronze medal at the world championships. He was no less dominant on the road winning two stages of the Arctic Race of Norway, a stage and the overall at the Boucles de la Mayenne, he finished second at the European championships and won the Ronde van Limburg. On top of those results, van der Poel holds the elite men’s Dutch national title in each of the three disciplines he’s been racing over the past year. After the cyclocross season, van der Poel will set his sights on his debut in the spring classics. He will race Gent-Wevelgem, Dwars door Vlaanderen, Ronde van Vlaanderen, De Branbantse Pijl and Amstel Gold Race. Despite it being his debut, expectations are very high. Last year, his ‘cross rival Wout van Aert made his spring classics debut finishing on the podium at Strade Bianche, in the top-10 at Gent-Wevelgem and Ronde van Vlaanderen, and 13th at Paris-Roubaix. Van Aert subsequently earned a three-year WorldTour contract with Jumbo-Visma. As a former junior road world champion, van der Poel is pegged to perhaps even exceed his ‘cross rivals exploits on the road. Unfortunately for diehard road fans and his cyclocross rivals, it doesn’t seem like they will have any respite from the van der Poel show until after the Olympics.